Super Savvy Mommy: EcoFont to Save Money and Ink--GENIUS!! EcoFont to Save Money and Ink--GENIUS!! Eco Font, who would have thought!? Even if you aren't out to save the planet, saving money is just as important as ever, right. You can download this awesome font, FOR FREE by visiting the link above. 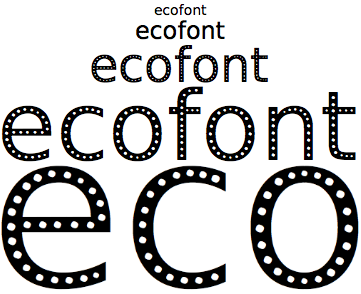 The picture above illustrates how the Ecofont was created by omitting parts of the letter. At the shown size, this obviously is not very nice, but at a regular font size it is actually very usable. Naturally, the results vary depending on your software and the quality of your screen. The Ecofont works best in OpenOffice, AppleWorks and MS Office 2007. Printing with a laser printer will give the best printing results. The Ecofont is based on the Vera Sans, an Open Source letter, and is available for Windows, Mac OSX and Linux. It took me all of about 1 minute to download and use. I am impressed. I will let you know now, I am all about Eco Font. As a matter of fact they don't even know I love it yet. They didn't pay me to tell you about it, after all, they are offering it for free, right? !